Known primarily for her work in video, both single- and multi-screen video installation, Judith Goddard also works with the still and printed image. Her work has been described as on-screen attempts to visualise concepts through images of external objects and events that by a process of manipulation of time and the moving image (editing, use of sound etc.) also become metaphors for internal states. She describes her current work as 'Tragic Collage'. Recent shows include A Century of Artists' Film in Britain, Tate Britain, 2003; Collage, Bloomberg Space, 2004; Wonderings, Great Eastern Street, London, 2005; Cross Town Traffic, New Delhi, 2005 and Analogue, Tate Britain, 2006. More recent screenings include the South London Gallery, 2007 and AV 08 Newcastle. 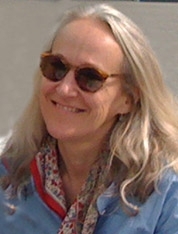 Her early work was archived by the analogue archive Rewind, Scotland in 2008 and is due to be archived by the British Film Institute. The first video work Goddard ever made is included in a DVD of early British video produced by the Lux in 2009 and will be shown in Art Now: Lightbox: Artists' Flm and Video Programme at Tate Britain, May 2010. Rewind & Play, Light box, Tate Britain, London "Time Spent"
6 artists video in Tate Britain's Light Box "REWIND + PLAY presents a selection of key works from the first decade of artists’ video practice in the UK. Work of that period is characterised by self-reflexivity in the medium, by an investigation of the limits of the then-new technology and by opposition to the dominant video form of the time: broadcast television". Helen’s Room, was a site-specific installation made for Kettle’s Yard in 2009. During the show a perspex screen placed in the doorway denied access to Helen Ede’s bedroom. A live signal from a surveillance camera showed parts of the room not visible to the viewer, on a television set and also on the Internet. The work dealt with what are for me, enduring questions about perception – psychic, cognitive and visual. In Helen’s Room the axis for those questions were situated within the home. Using the surveillance camera, the work explored a psychological dimension of the space - positioning us in relation to the seen, unseen, the private - public and gallery space. The work was supported by ADT Fire & Security for the equipment & technical installation. Swan Song is a two-page text/image piece commissioned by Transmission Annual 2010 for the book Hospitality. Written in response to the theme of the friend, it reflects on the artist’s relationship with the camera. The ‘song’ is deliberately articulated in rhyming couplets invoking the idea of play. Across the pages, the absurd and the mournful go hand in hand. DVD published by the LUX- REWIND + PLAY presents a selection of key works from the first decade of artist's video practice in the UK. From early conceptual experiments exploring the parameters of the medium to works dealing with media culture and television this collection explores the range and diversity of the first years of video as new media. See Disc 2 for Goddard's 'Time Spent, 1981 which was her first use of video, having previously worked with 16mm film.